The John Beech Memorial Handicap Tournament gave players a stern test at Pendle over the Easter weekend. With cold winds, rain, sleet and snow to contend with the players did well to complete their matches, even playing after dark. 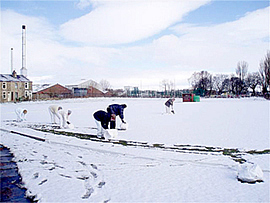 On Saturday players rolled huge snowballs around to clear the lawns for play and then had an early lunch to warm up. Manager David Maugham from Bowdon club also won the most games played trophy with 12 games but the overall winner was Jacob Carr from Tyneside, who won all his 11 games played and also collected the cup for the fastest game in just 42 minutes with a victory over David Maugham. 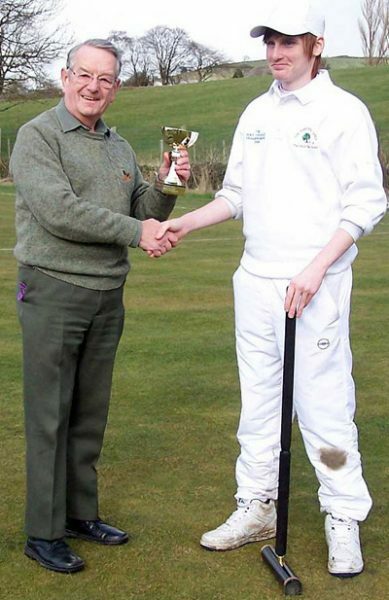 Lee Hartley collected the Low Bisque cup and Howard Bowron the High Bisque cup. Sadly vandalism by young footballers from the new playground and theft of three solar garden lights marred what was otherwise a friendly and enjoyable event in spite of the weather.